Students with 54 or more earned credits must submit an electronic preliminary Plan of Study through Student Administration before registering for courses for the following term. This typically happens during the fall of junior year, but may be sooner for students with AP, ECE, or transfer credit. The plan of study documents the program the student intends to follow to satisfy degree requirements for Mechanical Engineering. 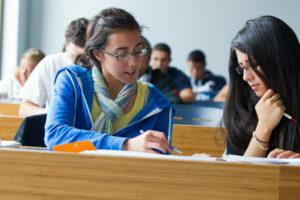 If changes are subsequently made, a final revised Plan of Study form must be completed before the end of the fourth week of a student’s last semester. Students who desire to be excused from any of the requirements or to substitute other courses for those prescribed must do so by submitting a petition to the Assistant Dean for Undergraduate Affairs. For example, a student who had calculus in high school and started in MATH 1132Q (116Q) might request exemption from MATH 1131Q (115Q), or substitution of PHYS 1201Q, 1202Q, 1530Q for PHYS 1501Q (151Q), 1502 (152Q). If three courses are substituted for two (as in the Physics example) credit for only two classes will be counted toward graduation. Exemption from course requirements or substitution of alternative courses must be clearly indicated on the Plan of Study form and explained in the “Comments” section or an attachment. Plan of Study approvals are done electronically. Preliminary plans will be approved by the student’s assigned academic advisor and a department representative. Additionally, final Plans of Study will be approved by the Assistant Dean for Undergraduate Affairs and the University Registrar. Once a student has an approved preliminary Plan of Study, any changes made to the plan should be checked by the student’s advisor. You do not need to re-submit your preliminary Plan of Study. Double Degree: Students may earn two separate bachelor degrees from two different schools or colleges of the University. Students must meet the requirements of both schools or colleges, and a Plan of Study form must be submitted to each department for each degree. An example of this would be the Eurotech program (with the College of Liberal Arts and Sciences): a student pursuing this program would submit a form for both the Mechanical Engineering and the Modern & Classical Languages departments.